Sunrise on the way to Lokiriama. Boda boda moterbike taxis flock to the Lokichogio petrol station to refill. 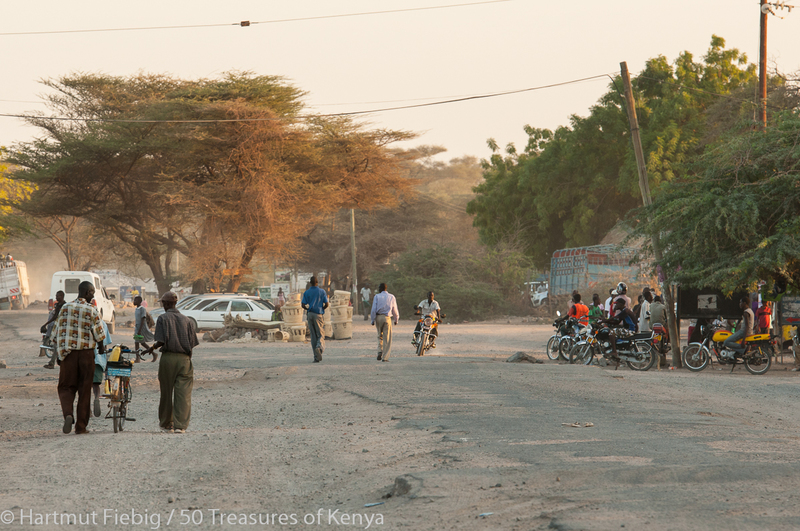 For detailed information about Lodwar, please check under Central Circuit. As the first day of the circuit from Lodwar to Kakuma involves a long drive, you are well advised to start your trip early. 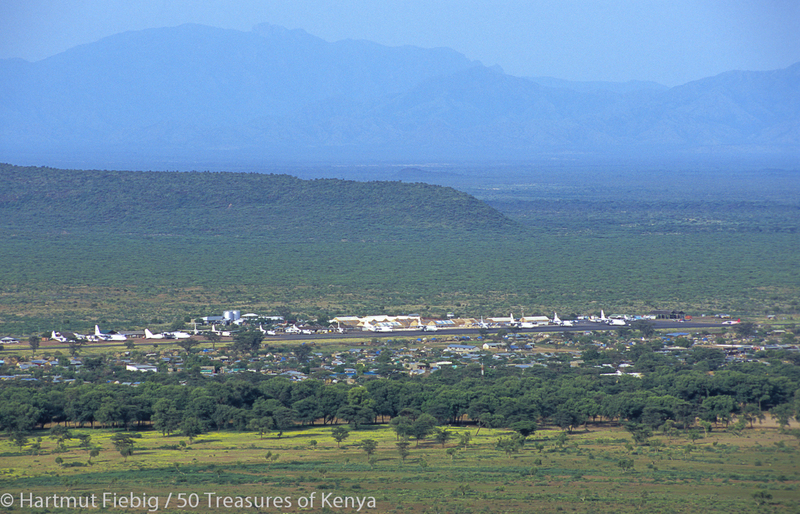 Loima Hills form a mountain chain west of Lodwar which stretches for 150km long alongside the Ugandan border. The mountains reach a height of more than 2000m and offer good hiking and rock climbing spots. On your way to Lokiriama you approach the southern end of the range. 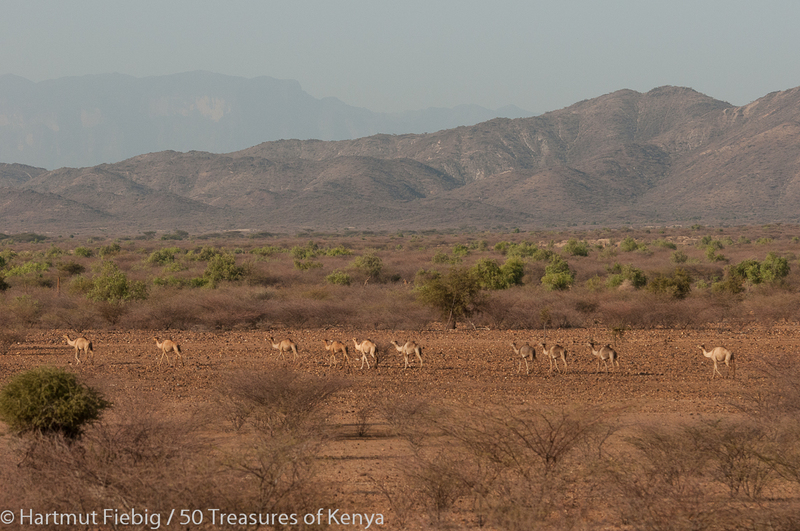 A camel herd moves in front of Loima Hills. After a smooth 120km drive over gravel and sand tracks through beautiful acacia land and broad seasonal rivers or lagas you reach Lokiriama near the border of Uganda. 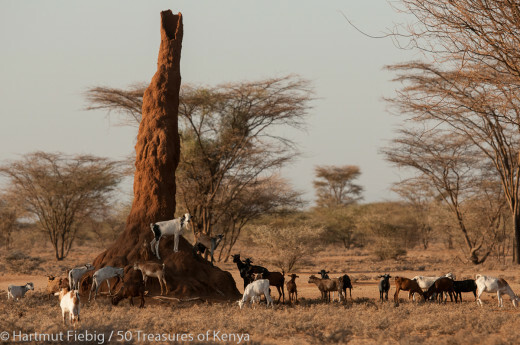 Turkana people live mostly off their goats and camels. 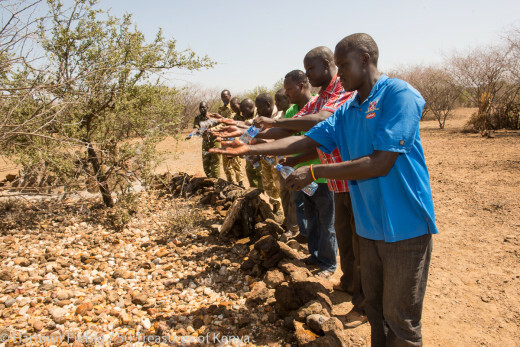 The village stands for a remarkable regional peace treaty struck between the Turkana and the Karamojong, Marle, Nyang’atom, Toposa and Jie tribes in Uganda and South Sudan. The peace accord was promulgated in 1973, lasting more than forty years to the day! The treaty is renewed and celebrated during an annual three day festival held in September which coincides with the World Peace Day. 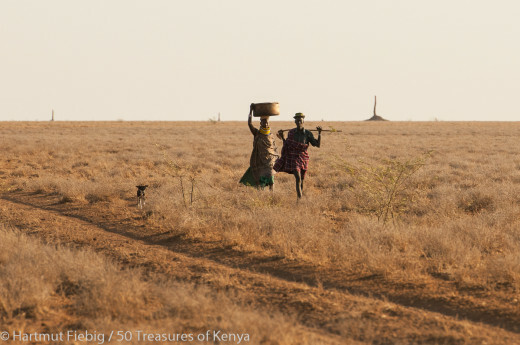 The festival offers a unique chance to witness the traditional culture of the Turkana people and their neighbours – an authentic, colourful experience. 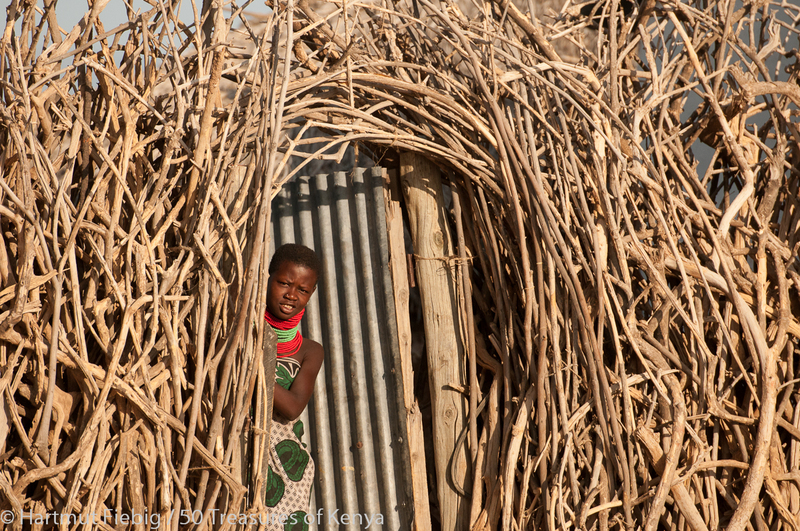 A young Turkana girl peeps through the door of the perimeter fence of her home. 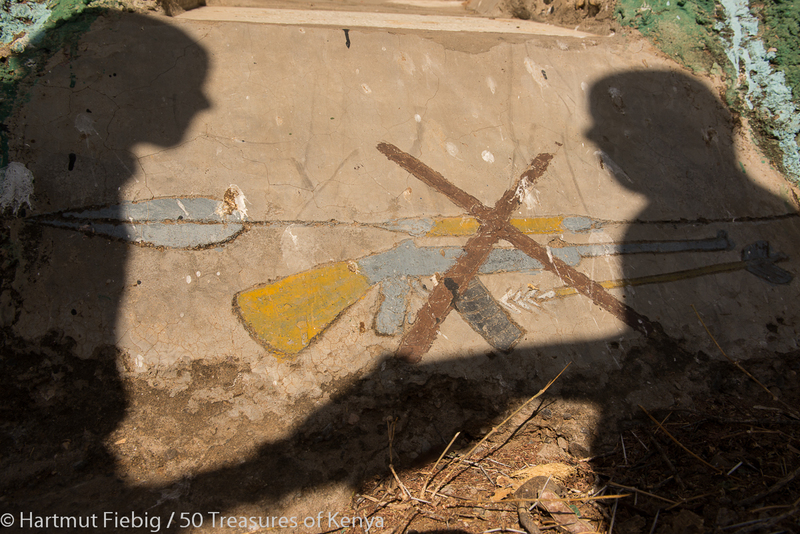 The site of the Treaty is marked by a concrete monument where weapons used in past battles and wars, including spears, matches, bows, arrows and guns all have been buried below. Weapons from past wars have been buried under a monument that marks the site of the Lokiriama peace treaty between the Turkana and their neighbors in Uganda and South Sudan. 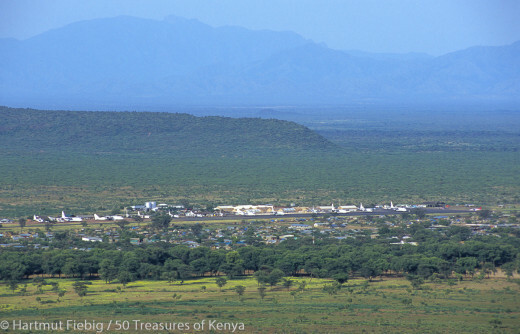 When driving on a gravel road from Lokiriama towards Kakuma, Loima Hills are your constant travel companion to the east. 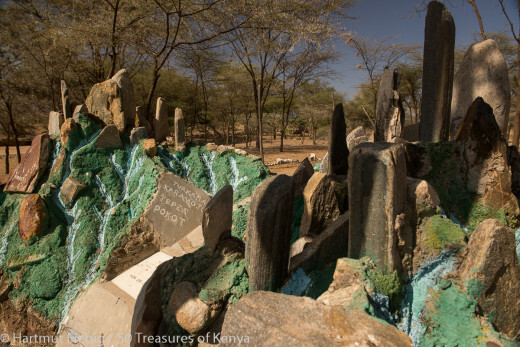 After about half the distance to Kakuma you have the chance to visit another site of superior traditional importance: Moruanayeche, the site where Nayeche, the mother of all Turkana is believed to have been buried. 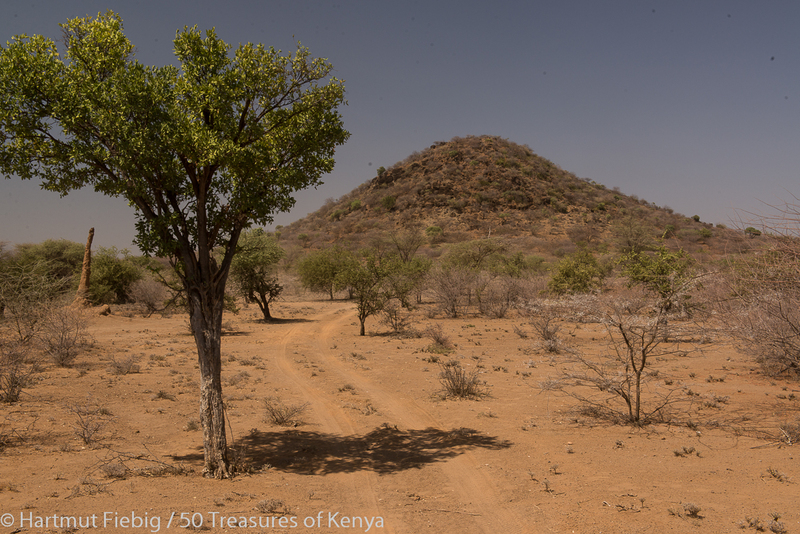 Morua in Turkana language means ‘hill’, so Moruanayeche is the name of the distinct hill near the grave of Nayeche, the mother of all Turkana. A huge circle of stones and pebbles marks the site where all Turkana speaking communities even from neighbouring countries congregate for a three day festival to celebrate Nayeche. All visitors have to obey the traditional rules, hence a local guide is required. The sacred burial site of Nayeche, the legendary mother of all Turkana people is marked by a big circle of stones and pebbles. No weapons or hats are allowed as people walk three times around the grave and throw a white stone each round into the circle before hands are ritually washed, water sprinkled into the rock circle and blessings are asked for. After walking around the grave three times, hands are washed, water is sprinkled on the grave and blessings are asked for. 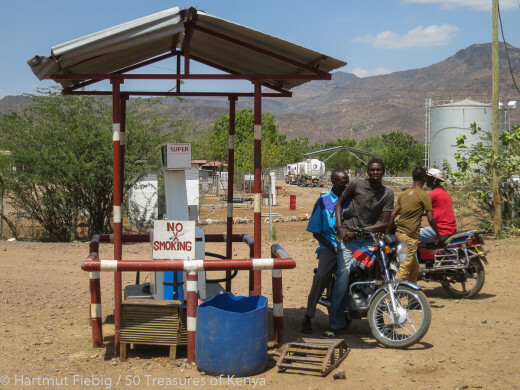 Kakuma is a hot town with rather limited infrastructure on the tarmack highway from Lodwar to Lokichogio, but you will find food, petrol and basic accommodation here. It is hard to believe that Kakuma is the second biggest town in the whole of Turkana Land, the majority of its population being refugees from South Sudan and other neighbouring countries who have found a safe asylum in the local UNHCR-camp. After rains, the seasonal river at the fringes of Kakuma town fills with water. 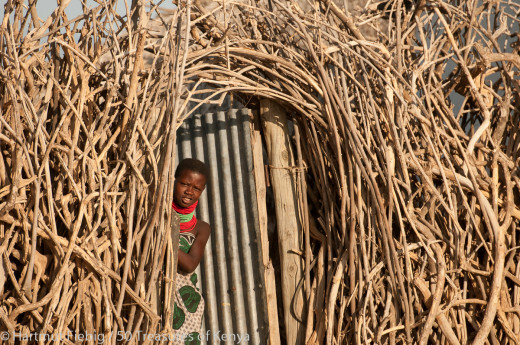 You may visit the refugee camp which rather resembles a proper town with houses, schools and hospitals, places of worship, shops and restaurants and enjoy the cultural mix and excellent food of South Sudan, Uganda, Ethiopia and Somalia. Kakuma offers decent local food shops, petrol stations and basic accommodation. 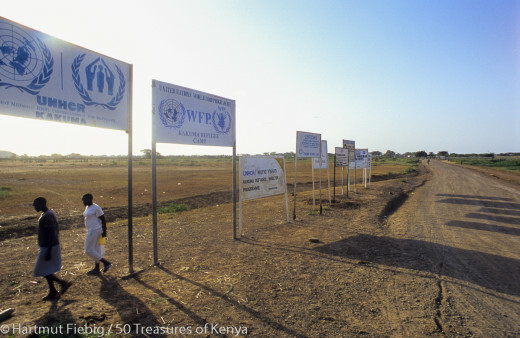 A forest of signs mark the access road to Kakuma refugee camp. Lokichogio lies in a wide valley between Songot Mountains to the south and Mogilia Range in the north. 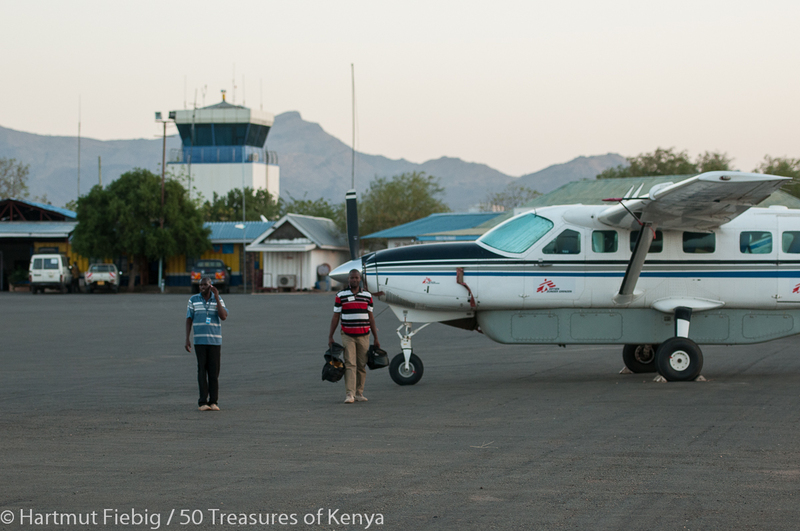 At first, it might appear surprising that an airport with tarmacked runway as well as excellent accommodation and food can be found in the very last corner of Kenya. 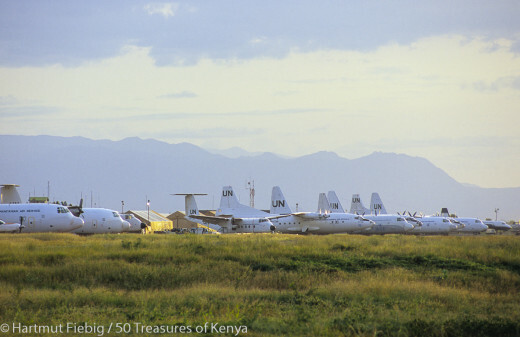 Lokichogio airport boasts one of the most modern towers in the whole of the country. It all falls into place when you know that Lokichogio was the major logistic hub for Operation Lifeline Sudan, a UN-financed air-bridge to supply vast regions with drugs and food by planes for long years during the civil war in neighbouring South Sudan. Planes of the air-bridge of Operation Lifeline Sudan line the runway of Lokichogio airport. 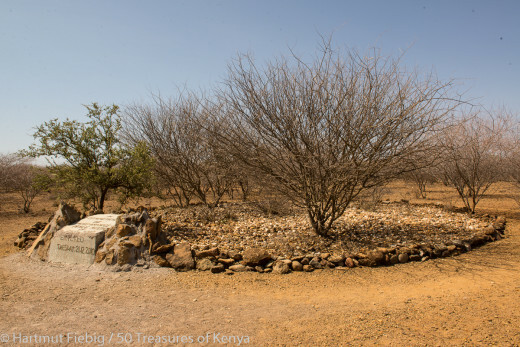 Lokichogio and surroundings own some interesting sites, like the dam at the fringes of town which attracts uncounted herdsmen and their thirsty animals, or the Mogilia Range which rises right behind town offering plenty of hiking opportunities and wonderful views. The undisputed heart of Lokichogio is the airport. You can expect accommodation with high standard and excellent food in Lokichogio, such as Trackmark, Fly748 or Afex Camp which are all situated a bit out of town. Otherwise, you are left with the usual local lodgings and small restaurants and bars in the centre. 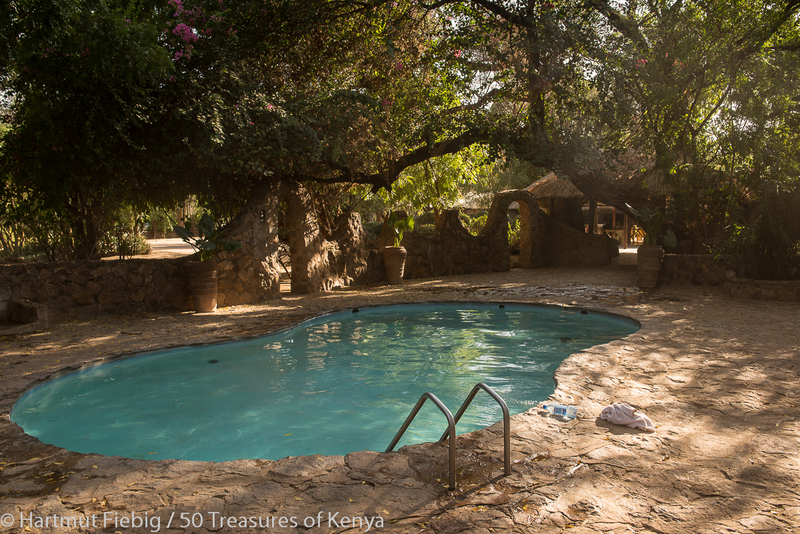 In the heat of northern Turkana Land, the swimming pool of Trackmark camp offers refreshment and pleasure. 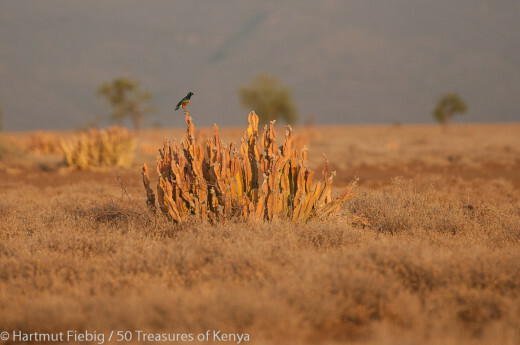 However, Loitikipi Plains which unfold some 20km out of town, in the northeast of the impressive Mogilia Range the offer the biggest experience. Up to the horizon stretches an endless sea of grass. The most conspicuous plant of Loitikipi plains is a succulent euphorbia. The plains are perfectly even except for sporadic ant hills and the silhouettes of cattle and their herders. But the lush grasslands also lures big numbers of game to the plains. 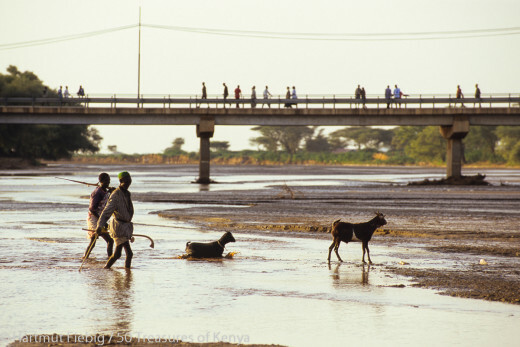 Animals don’t know borders and so they migrate seasonally between here, South Sudan, Ethiopia and Northern Uganda. 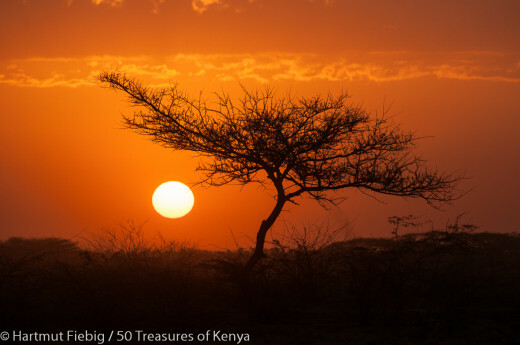 This explains why Loitikipi Plains are sometimes called the little Serengeti of the North. A Turkana couple crosses the vast Loitikipi plains. In 2013, the Loitikipi Plains produced some headlines when giant underground water reservoirs were detected which might end some of the serious water problems in Turkana Land. You can visit the sealed pipe where the water has been struck. Hon. 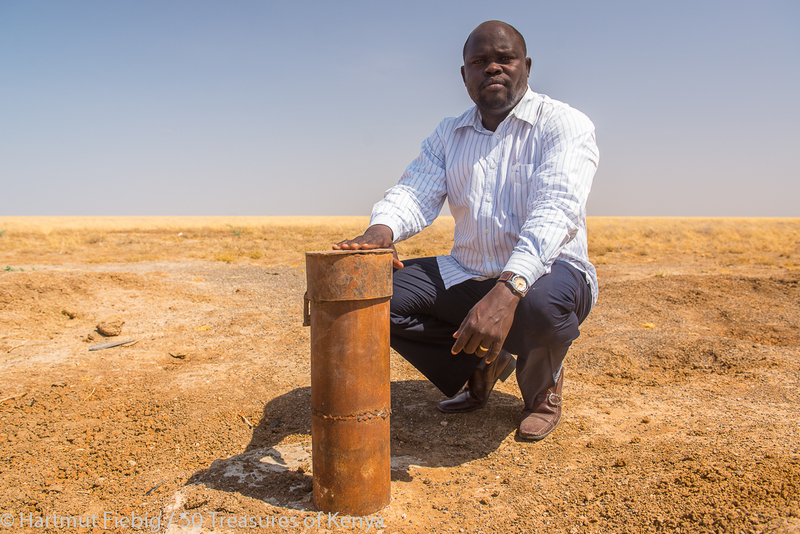 Lynus Ebenyo, Tourism Minister of the County shows the sealed pipe of the giant water reservoirs underground which brought Loitikipi Plains to the headlines in 2013.